In conjunction with the National Museum of Singapore’s exhibition on “A Changed World”, Urban Sketchers Singapore was invited to host a sketchwalk on the museum grounds. It was an opportunity to introduce an interested public to the art of urban sketching: a worldwide freehand sketching phenomenon that is catching on like a forest fire on a summer’s day. Speaking of a hot summer’s day, the registration and the impressive turnout in spite of the turbid hot day was certainly encouraging. 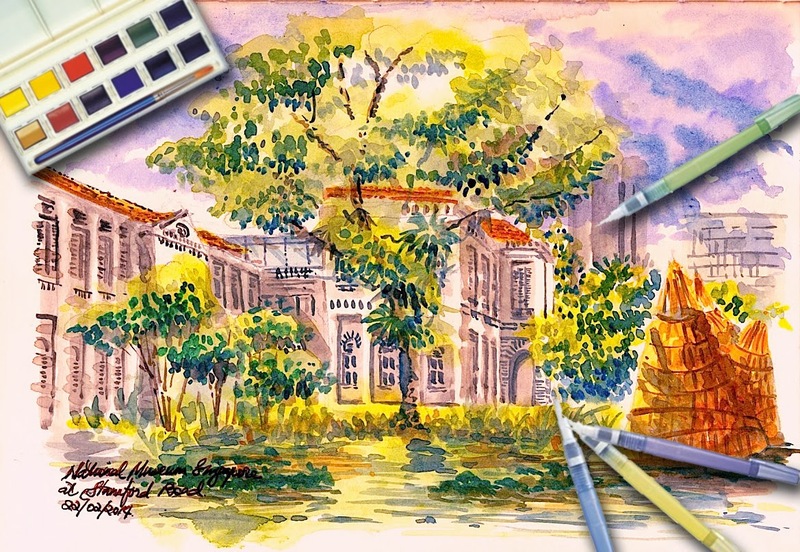 After a short introduction of the group by resident sketcher, Paul and founder of the Singapore chapter, Tia, the group went on their merry way to capture scenes with their pen and paper, live from the grounds of the museum. Not being a fan of UV-overdose, I settled myself at a café nearby, overlooking the eastern façade of the building and did myself a watercolour sketch. Once again, the Stillman and Birn paper did wonders for my sketch and I was completely satisfied with my ability to tease out the various hues, tints and shades from my very economically coloured Daler & Rowney pocket watercolour with my Zig waterbrushes: the day’s effort allowed me to capture a side of the museum building (pun intended) I have never tried before. The National Museum of Singapore (新加坡国家博物院) is a national museum in Singapore and the oldest museum in Singapore. Its history dates back to 1849 when it was started as a section of a library at Singapore Institution. After several relocations, the Museum was relocated to its permanent site at Stamford Road at the Museum Planning Area in 1887. The Museum is one of the four national museums in the country, the other three being the two Asian Civilisations Museums at Empress Place Building and Old Tao Nan School, and the Singapore Art Museum. The museum focuses on exhibits related to the history of Singapore. The Museum was named the National Museum of Singapore in 1965. For a brief period between 1993 and March 2006, it was known as the Singapore History Museum, before reverting to its previous name. The Museum underwent a three-and-a-half-year restoration and reopened on December 2, 2006, with the Singapore History Gallery opening on December 8 of the same year. National Museum was designed in Neo-Palladian and Renaissance style and consists of two rectangular parallel blocks, with a dome at the front of the building. Its architects were Henry McCallum who designed the original version and J.F. McNair who designed the scaled down version of the building. The building has two rotundas, a new glass-clad rotunda at the rear area of the building. Its glass rotunda is a cylindrical shaped building which is made up of two drums, with the outer one made of glass which sheathes an inner one made of wire mesh. Black out curtains has the same length of the inner drum with images projected on sixteen projectors in the day. The curtains are drawn after sunset, and projection can be beamed out through the glass to get a view of the city. Coats of arms are found on the building's front. The redeveloped building was designed by local W Architects with the glass-clad rotunda designed inspired by Chinese American I.M. Pei. The chief design consultant was Mok Wei Wei from W Architects, who was appointed in June 2004 and modified the designs of the glass rotunda and the atrium between the two buildings. The new glass clad building was designed such that the old building would still be the centrepiece of the museum. A six-metre gap exists between the back of the main museum building and its new annexe as conservation guidelines do not allow old and new buildings to be directly connected. In the gallery theatre, bricks are designed in a herringbone brick pattern, which helps to control the echoes and acoustics in the space. Initially, the designers planned to use bricks from the old National Library building, but the cost was too expensive. Black concrete flooring was used for the new block instead of gray granite flooring as initially planned.